McGanniversary Week: HORROR OF GLAM ROCK Review | Warped Factor - Words in the Key of Geek. Fresh from her first adventure on board the Tardis, Lucie Miller is hoping for great things as she heads off into time and space with the ‘great frock-coated ponce’ that is the Eighth Doctor. The M62 motorway, in the snow of 1974…would probably struggle to qualify as a great thing. Nevertheless, it’s where the Doctor and Lucie find themselves for their first post-Dalek adventure. 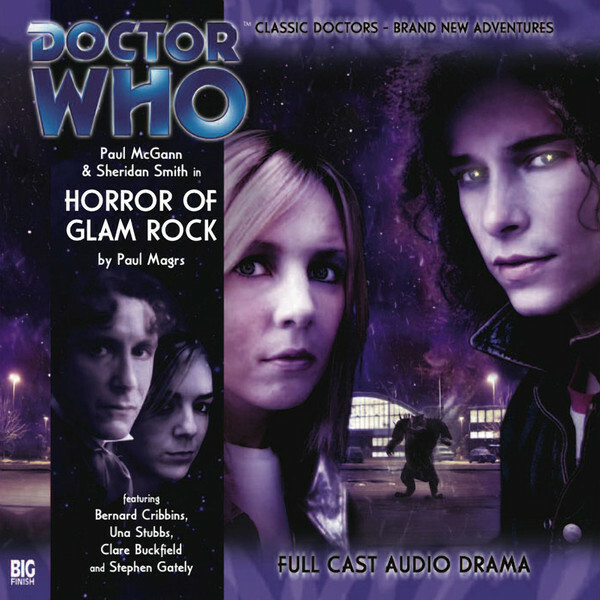 Horror of Glam Rock, by Paul Magrs, is probably one of the oddest ‘base under siege’ stories in the history of Doctor Who, mostly because the nature of the ‘base’ is so thoroughly unprepossessing. In a way, it feels like Magrs is channelling PJ Hammond in full-on Sapphire and Steel mode, but it’s simpler than anything Hammond ever came up with – just a handful of lost souls hoping to find meaning, mostly through music, on the road to Wonderland (or Top of the Pops, which in 1974 was about the same thing). And into their haven of sausage sandwiches and hot, strong tea on a bitter night comes Weirdness. Weirdness with an appetite for human flesh. Horror of Glam Rock is of particular note for a handful of reasons. First, it’s the immediate post-meeting adventure for Sheridan Smith’s Lucie Miller, and in a move that mimics the returned TV incarnation of Who, it introduces us to a member of her family. Secondly, the family member it introduces is Aunty Pat, who will go on to be featured in another two stories, and lead indirectly to the first big break between the Doctor and Lucie. Thirdly, it brings British legends Bernard Cribbins and Una Stubbs into the Doctor Who family, adding some solid acting clout to the relatively simple ‘aliens in the car park, looking for a meal’ storyline, and fourthly, it’s set in the age of glam rock, among a bunch of musicians looking for their break. In the age of Bowie and Bolan, it’s fitting therefore that up and coming musical duo ‘The Tomorrow People’ (seriously, you have to love Paul Magrs’ chutzpah sometimes, it’s just delicious), Tommy and Trisha Tomorrow, are intimately connected to the encroaching alien threat. As with a surprising number of Magrs scripts, there’s a real depth of social texture in the characters and their interactions throughout the story, Cribbins’ band manager Arnold Korns coming across almost as a kind of Svengali-Fagin character, putting himself out for his latest discoveries, but not especially caring about anything outside the sphere of what will make him more money. Flo, the manager of the service station café, allows Una Stubbs the chance to essentially perfect the almost stream-of-consciousness gossipy-gibber she would go on to make her own as Mrs Hudson in Sherlock, her ability to deliver such naturalism coming as a surprise because it’s at odds with many of the roles for which she was previously best known (including Aunt Sally alongside former Doctor Jon Pertwee in Worzel Gummidge). The Tomorrow Twins feel like a gentle riff on the likes of Sparks, brothers Ron and Russell Mael electrifying (not to say, in Ron’s case, terrifying) audiences throughout the seventies. In particular, Tommy Tomorrow, played by real pop star Stephen Gately, is given that combination of artistic temperament and addiction to oddness that made many of the seventies’ greatest stars into legends – Bowie, Bolan, Bryan Ferry, Elton John etc. Anyone who creates his would-be hits on a stylophone is one to watch… one way or another. There’s a punch and a pace to events that feels both rapid and unusual. Shortly after all our players reach the café – which itself is shortly after the first death and the credits – big bearlike monsters are roaming the car park and barricades are being built. When the Doctor supervises their construction, it’s even remarked on: ‘You believe us? We’ve just told you there are bear-things in the car park with scales and tales, and you just believe us?’ It allows the pace to be pushed – in the early days, Eighth Doctor stories were like Fourth Doctor adventures to this day, for the most part single hour-long stories - and having the Doctor take charge cuts down on extraneous faff, but it doesn’t stop the bodies piling up as one by one or group by group, people decide they’ll take their chances with the bear-things, because clearly, the fact that everyone else has died trying that doesn’t mean that they will die trying it. So we lose an occasional roadie just to spice the storytelling up, and when Korns tries to take The Tomorrow People out to meet their destiny on Top of the Pops, an entirely different destiny is met and fewer people come back than went out. All the while, the musical connection percolates through the tension, as Tommy Tomorrow (who we should say is rendered with an impressive flawed humanity by Gately) is inviting some aliens he knows as ‘The Only Ones’ to come and visit them through his ghastly stylophone music. Not the bear-like ones outside, of course, that would be absurd, but the wispy, perfect, lonely beings who are, they tell him, ‘the only other species in the universe’ and who want to cherish him and his music, to take him away from all this. There’s a gloriously Troughton, Pertwee, or even McCoy vibe to the way the Doctor deals with the threat, something fantastically ramshackle and British about his last-minute lash-up, and in a slightly kinder spirit than that of Horror of Fang Rock, one or two people actually survive the night thanks to the Doctor and Lucie’s intervention, a funnel and an ever-timely sausage sandwich. But in a way, though Horror of Glam Rock delivers great atmosphere (you can almost feel the cold and uncertainty of the characters whose lives are interrupted by the weirdness of this night), and great pace (as mentioned, this story establishes its threat pretty quickly, and occasionally feeds another victim to it to keep us focussed), the real point of the story is the interaction between Lucie and her Aunty Pat. Except of course in 1975, 21st century girl Lucie isn’t even born, so she’s simply Pat Ryder, of the band Methylated Spirits, struggling to get noticed, dismissed as awful by managers including Korns, and wondering whether she’ll ever hit the big time. Then out of nowhere, along comes Lucie Miller, rookie time traveller, claiming to be her niece from the future and without thinking, telling her that in that future, she’s ‘erm…well, nothing. Nothing special, I mean. You’re not a pop star or anything. You’re just…Aunty Pat.’ Lynsey Hardwick as the young Pat plays the role with a notable similarity to Sheridan Smith’s Lucie herself, but their meeting, and Pat’s coming to believe that what Lucie says is true, that she’s her niece from the future, shows us the potential body-blow of time travel. Lucie never means to be mean to her favourite aunty, she just doesn’t think that being ‘just Aunty Pat’ is a bad thing. But for Pat Ryder, the experience is potentially pivotal, and certainly by the next time we meet her, ten years on in her personal timeline in The Zygon Who Fell To Earth, Pat has given up her dreams of a career in music, certain as she is that she’s had confirmation that they never come to anything. While Paul McGann remains in charge of his Doctor and the situation here, it becomes clear by only her second story that Sheridan Smith’s Lucie Miller is a character who won’t take any nonsense from the floppy-haired Time Lord or indeed the universe at large. She’s quick to show compassion, occasionally too gobby for her own good, and never afraid to pass wry comment on the madness to which life in time and space exposes her. And while her predecessor Charlie Pollard was no shrinking violet either, there’s a different, distinctly northern, working class sense of humour and irritation in Lucie Miller, which Paul Magrs delivers exceptionally well whenever he writes for the character. The Horror of Glam Rock has Cribbins, Stubbs, Sheridan Smith, Paul McGann, and Stephen Gately doing proper acting. It has aliens, stylophones and an introduction to Lucie’s Aunty Pat, a character of whom we see more throughout the Eighth Doctor’s life and whose first story you just don’t want to miss. Oh, and as an extra, there’s even a glam rock version of the theme too. Get your platform shoes out of the Cupboard of Shame today and give Horror of Glam Rock a listen.